Following an historic 2018 election that ushered in a wave of new female lawmakers, women are already setting records in their quest for the presidency. Four women to-date have now announced their intention to run for the White House in 2020, amidst a field of what is expected to be a dozen top contenders. 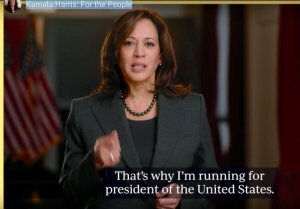 Among the most anticipated was US Senator Kamala Harris (CA), who made her announcement on ABC's Good Morning America Sunday, while releasing an online video debuting her decision and campaign slogan, "For The People." Harris was elected in 2016 as California's junior Senator, succeeding retiring Senator Barbara Boxer and becoming the first minority woman elected to the US Senate from the state. The daughter of immigrants from India and Jamaica, she is only the second African American woman to serve in the United States Senate. Harris previously served as the 32nd Attorney General of California from 2011 to 2017, and as District Attorney of San Francisco from 2004 to 2010. A native of Oakland, California, she is a graduate of Howard University and the University of California, Hastings College of the Law. Harris has distinguished herself as a member of the Senate Judiciary Committee and is expected to emphasize her background as a prosecutor and defender of the people, while appealing to the critical primary targets of millennial, minority and female voters. Harris, 54, launches with a full-fledged campaign operation and senior staff and will headquarter her campaign in Baltimore, Maryland, with a second office in Oakland. "I am going to run for president of the United States because as a young mom I am going to fight for other people's kids as hard as I will fight for my own, which is why I believe health care should be a right, not a privilege." Elected to the US Congress in 2006 as the Representative from Albany, Gillibrand was appointed to the Senate in 2009 to succeed Hillary Clinton when she became Secretary of State. She subsequently won the 2010 special election to fulfill the remainder of Clinton's term and was re-elected in 2012, and in 2018 with 67% of the vote. 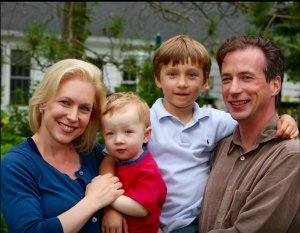 Gillibrand, 52, was born and raised in upstate New York to two parents who were attorneys, and graduated from Dartmouth College and UCLA School of Law. Gillibrand has established herself as an ardent Trump foe, and a leading voice in the anti-sexual harrassment and #MeToo Movements via her early efforts to uncover sexual assault in the military. Her public criticism of former President Bill Clinton's actions in office, and her 2017 call for fellow Democratic Senator Al Franken (MN) to resign over allegations of sexual misconduct, however, has alienated some colleagues and party faithfuls. Originally a centrist who once received an "A" rating from the NRA, Gillibrand's positions on guns and immigration have moved decidedly to the left in the Senate, including a call last year to abolish the US Immigration and Customs Enforcement (ICE). In an interview aired on Saturday, January 12th on CNN's The Van Jones Show, Hawaii Congresswoman Tulsi Gabbard became the second woman to announce her intentions to run. Gabbard was first elected to public office in 2002, at age 21, when she became the youngest legislator ever elected in Hawaii's history and the youngest woman ever elected to a US state legislature. Gabbard left the legislature to serve in the Army National Guard, where she was twice deployed to the Middle East between 2005 and 2008, and continues to serve as a major in the Hawaii Army National Guard. In between tours she served as a legislative aide to Hawaii US Senator Daniel Akaka. Although more conservative during her state legislative years on issues such as gay marriage, Gabbard has since moved toward the progressive populist wing of the Democratic party, and was one of the earliest supporters of Senator Bernie Sanders 2016 presiden'tial bid. She touts health care access, criminal justice reform and climate change as key platform issues, and has staked out a reputation as an independent-minded, anti- interventionist on foreign policy as a member of the House Foreign Affairs Committee. 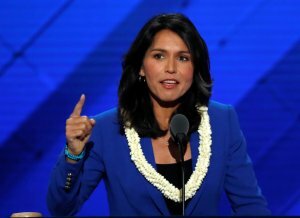 A longtime opponent of the United States' military involvement in Syria, in 2017 Gabbard met with Syrian President Bashar al-Assad, who has been accused of war crimes -- a move that brought widespread criticism from both political parties. In a January 19-21 Public Policy Polling survey (Margin of Error +/- 3.6%), President Trump currently lags behind seven of the declared or anticipated Democratic candidates in head to head match ups for the 2020 race. Trump trails Joe Biden 53%-41%, Bernie Sanders 51%-41%, Kamala Harris 48%-41%, Beto O'Rourke 47%-41%, Elizabeth Warren 48%-42%, and Cory Booker and Kirsten Gillibrand each 47%-42%.